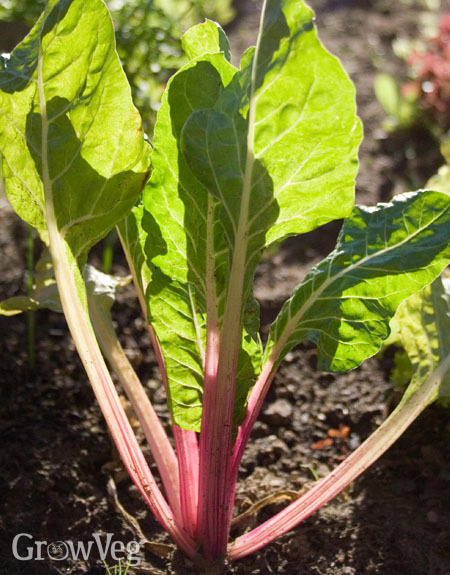 Ruby Chard – deep red stems with a deep green leaf. There is also a variety that sometimes comes in mixes such as ‘Bright Lights’ which has a dark bronze-colored leaf. A related type ‘Rhubarb chard’ is very similar with thicker stems. The colors are so striking that they can easily form the basis of a colourful garden display – my neighbor who grows a beautiful array of flowers in his garden recently asked what ‘those bright coloured plants’ were in my vegetable patch, as they make a striking feature. As well as colorful types there are specific varieties bred to be a substitute for spinach. These tend to have thinner white stems but the leaves are softer and less ‘leathery’ in feel. The great advantage of these over spinach is that they don’t bolt as easily so you get a good crop over a longer period of time, particularly during hot weather. They also survive in much colder weather making a good fall crop. My favorite type for this kind of cooking is one which is often not even called chard but is labelled ‘Perpetual Spinach’. Perhaps the reason that people are unfamiliar with chard is that few supermarkets and grocery stores stock it. To the uninitiated it may seem a little tasteless and the leaves are thicker than many of the leafy vegetables we cook with. However, I find it works very well in dishes where you are looking for additional texture and colour, whilst letting the taste come from other ingredients, herbs or spices. The stalks give a similar crunch to celery when cooked and the leaves can be shredded and added towards the end so that they retain their high vitamin content. Generally it is advisable to let the leaves quickly boil (rather than steaming) to reduce the oxalic acid, making them slightly sweeter. Try stir frying it with soy sauce, chopping it into stews, adding to minestrone soup or any of these ideas for cooking with green vegetables. Baby leaves can also be used to add color and texture to salads.